Unique Bouquet Options | Get Me To the Chapel! So, you don’t want to go with the real flower bouquet, and you don’t like the idea of a fake flower bouquet. Here are a few options! I found this bouquet idea in the new Flea Market Style Weddings magazine. If you guys haven’t checked it out, please do! 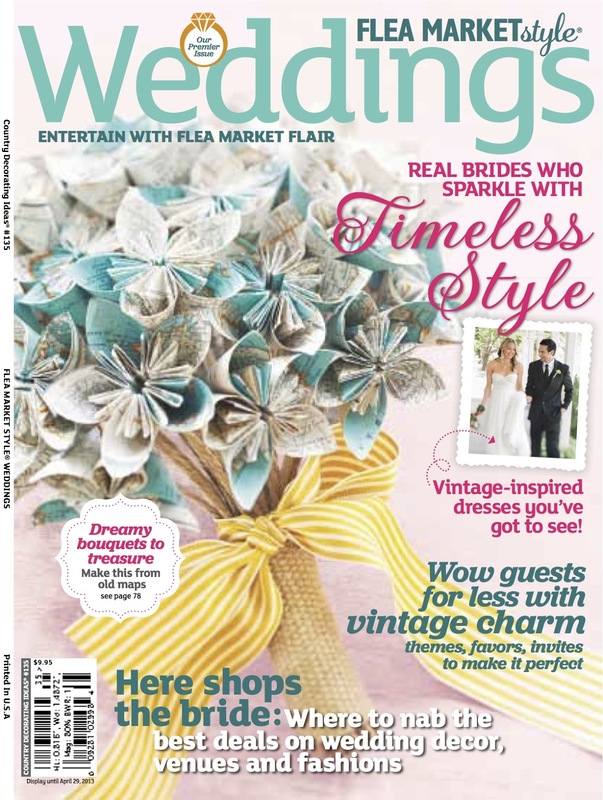 It is such an amazing resource for any bride..or anyone helping to plan a wedding..who wants to use vintage touches in their wedding. The particular bouquet is actually featured on the cover of the magazine. Isn’t it amazing!? The particular bouquet featured is actually made of a vintage map, but you could use a new map. Make it extra-special by choosing to use map pages of a place that is special to the both of you. Or, you could use pages from favorite books, or, as I imagined, pages from a playbill from a show the two of you like or have seen together. Plain paper is also an option, of course. There are so many variations you could do! Here are the directions on how to make the origami flowers. Here is another option where you could get really creative. Again, you wouldn’t HAVE to use pages from books. If you are a book lover like me, you get emotional just thinking of destroying a book, but it’s a good project for using those old, useless books you find at garage sales and flea markets. Of course, regular paper and scrapbook paper with various patterns and colors would look gorgeous, too. There are several styles of paper flowers you can make, and here are some tutorials for pretty much any style. You can mix and match to your heart’s content! Ah, the antique brooch bouquet. I want one of these for when I get married, but I really don’t think I would be able to do it by myself, and they get pretty pricey when you have them made for you. Miranda Lambert carried one of these when she married Blake Shelton, and they’ve gotten even more popular since then. This bouquet isn’t just lovely, it also incorporates the something old aspect into your wedding. Browsing around antique shops and flea markets, you can find plenty of antique brooches to fit your needs! Here are some tutorials for you, just in case you decide to make your own. Think outside the box! Mix all these tutorials with silk flowers and fresh ones, too, for a very unique bouquet!